It’s that time of year when we reflect on what’s happened over the past year, and look ahead to the next. In this article we examine the results of our recent industry survey on the outlook for 2019, and also some of the trends we are seeing emerge. The political environment has certainly been eventful in 2018, and so it’s not really surprising that our survey identifies political uncertainty as the most significant challenge for the insurance industry in 2019. While many insurers and reinsurers have already taken some steps to restructure their organisations ahead of Brexit, there remains a risk of market dislocation and subdued demand in the event of no-deal. Even if there is a “clean” Brexit, there remains lots of uncertainty over the future trade agreement, and therefore the economic and regulatory landscape. Regulatory change is another big challenge. The recent deferral of the introduction of IFRS 17 and the recent policy statement PS31/18 on equity release mortgages will provide relief to some insurers though. When it comes to new opportunities in 2019, the biggest opportunity seems to be adopting new technology, with new markets/products, mergers and acquisitions and responsible investment not far behind. This echoes some of the recent trends we have seen, with insurers increasingly looking at how they can adopt new technologies, and a desire to grow either through acquisitions or through increasing new business volumes in the protection and retirement markets. Responsible investment is increasingly moving up the agenda, the increased focus on this topic may be attributed to greater attention from regulators and the government as well as the media shining a spotlight on corporate governance failings and environmental concerns. 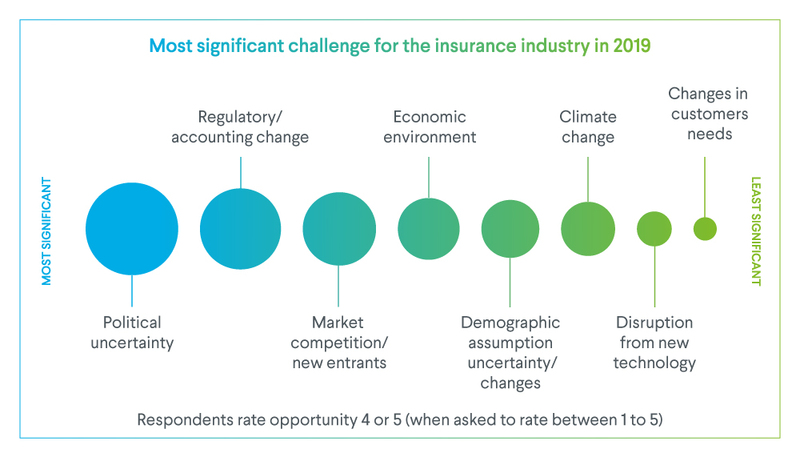 Whilst it could present a strategic opportunity for insurers, climate change itself appears to be an area where the industry is not well prepared. 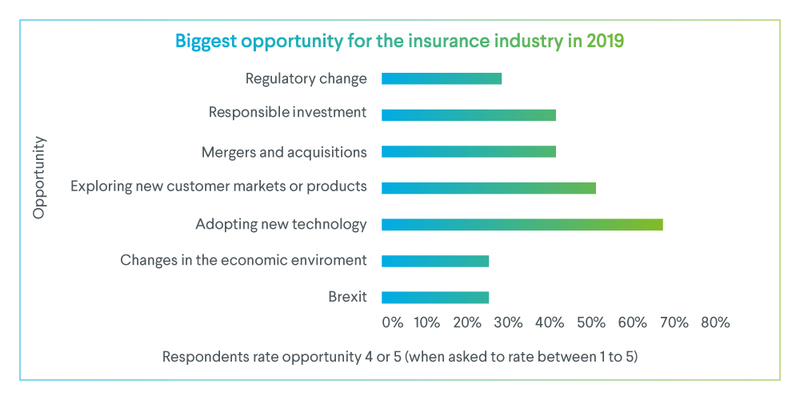 Interestingly, when we asked how well placed the insurance industry is to deal with the various opportunities and challenges in 2019, we found that it was least well prepared to tackle new technologies, both in terms of using technology to create new opportunities for growth and also dealing with the disruption it may create. 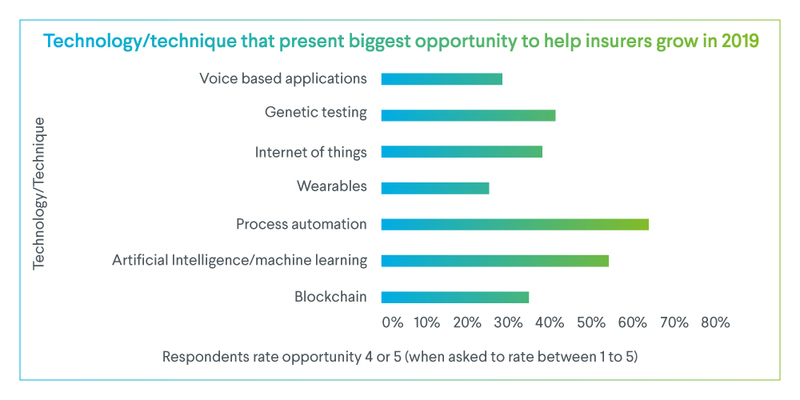 In terms of specific technologies process automation, adoption of artificial intelligence, genetic testing and the Internet of Things present some of the biggest opportunities according to our survey. New technology presents significant opportunities to improve the customer journey and make it easier for customers to access products and services – an area we are already seeing activity from clients. With smart home devices expected to be a popular buy this Christmas - in fact about 30% of people are planning to purchase a smart home device in the next two years – could this be a new way to engage with existing or new customers? We certainly think it could be. Leveraging our own data modelling skills and Club Vita we have recently experimented with a prototype app that allows customers to ask Alexa for a bespoke life expectancy projection to help them think about their own retirement needs. 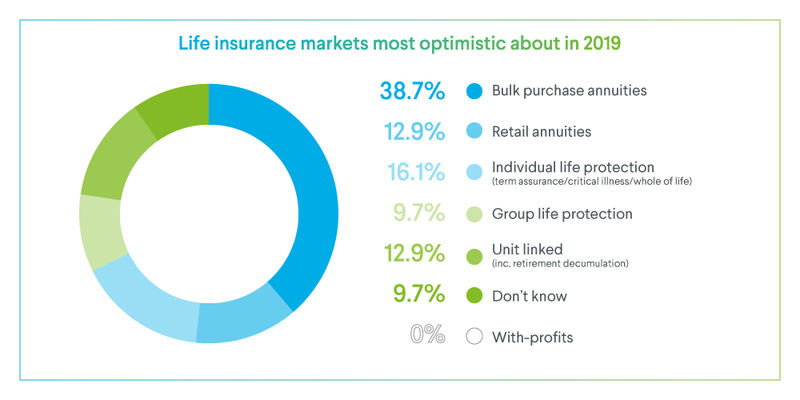 In terms of specific markets, our survey also reveals that the insurance industry is by far most optimistic about the bulk annuity market in 2019. However other markets, such as the individual protection and retail annuity markets also look positive. Analysis conducted by our Risk Transfer Team estimates there will be approximately £20bn of bulk annuity business transacted in 2018, a 50% increase on the previous record of £13.2bn set in 2014. Another survey conducted by Hymans Robertson also showed that Independent Trustees are expecting there to be an even higher value of transaction in 2019 compared with 2018. So the future certainly looks bright, with an estimated total of £2.3trn of Defined Benefit liabilities that could be bought out in the years ahead. With other insurers and reinsurers looking to enter the market we expect it to be a competitive and active part of the life insurance market in 2019. For insurers to be successful in this market they will need to have a deep understanding of; longevity risk, both for younger and older lives, capital optimisation approaches and asset-liability management strategies, as well as address operational matters like GMP equalisation. All in all, 2019 looks set to be an eventful year in terms of political events, and technological advancements, but also a year that has significant growth potential for the life insurance market.